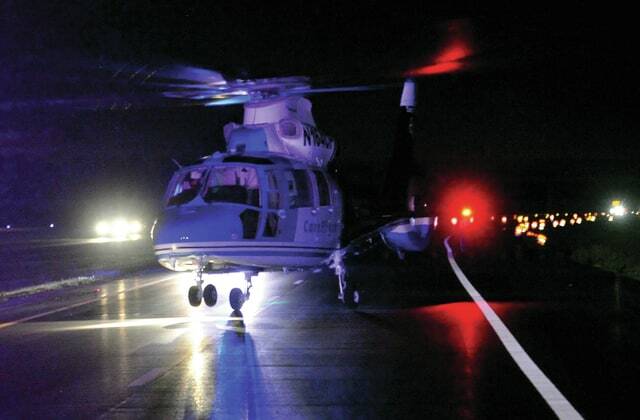 Mike Ullery | Daily Call CareFlight lifts off from the scene of a single-vehicle crash on southbound I-75 near the 85-mile marker on Thursday night. Passenger Kristin Osborne, 16, of Sidney, was killed in the rollover crash, and two others, the driver and another passenger, were injured. SIDNEY — A young woman who died Thursday night in a single-vehicle crash on Interstate 75 South has been identified as 16-year-old Kristin Osborne, of Sidney, according to a press release from the Piqua Post of the Ohio State Highway Patrol. Two Piqua teenagers, Logan Jessup, 17, who was driving, and passenger, Makinzie Jessup, 13, were injured in the accident, which occurred at approximately 10:08 p.m. Thursday at the 85-mile marker of southbound I-75 in Orange Township, Shelby County. According to the release, Logan Jessup was traveling south in the left lane of I-75 when his Ford Explorer veered off the west edge of the roadway, struck a ditch and overturned. Troopers from the Piqua Post responded, along with the Sidney Fire Department & Emergency Services, and the Piqua Fire Department and EMS. The accident closed southbound lanes for about half an hour, with one lane open after that, as the highway was closed to allow CareFlight to land and the highway patrol to conduct its investigation of the crash. Logan Jessup was transported by CareFlight to Miami Valley Hospital in Dayton, where he was reported to be in critical condition in the intensive care unit on Friday. Makinzie Jessup was taken by Piqua EMS to Upper Valley Medical Center in Troy. No information was available about her condition.